The use of these self-ordering kiosks in restaurants help grow sales as well as prevent consumers from leaving its line. Advanced kiosks with S12 industrial computer displays have been proven to optimise and speed up services in many food businesses. 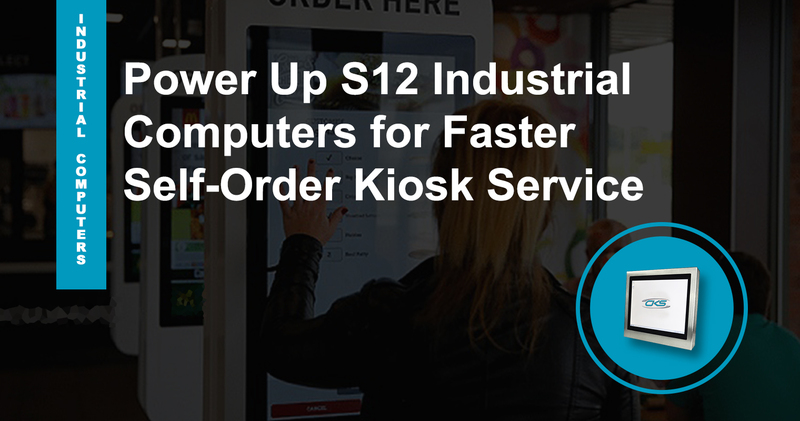 Designed for kiosk applications, the S12 industrial PCs can have the features that have the flexibility to support future applications and kiosk updates. Majority of the consumers now prefer using self-ordering kiosks. Based on the latest Self-Service Kiosk Index, 18 percent of the consumers already use self-ordering kiosks. On the other hand, around 60 percent of these consumers would want to use this physical gizmo [Tillster]. This only means that customers’ behaviour is changing its pace. The use of these advanced kiosks can help grow sales as well as prevent consumers from leaving its line. Moreover, one of the most significant contributors to this improvement is installing the best feats of the computing system. Fortunately, our 12.1” industrial-grade computer displays can have the required specifications and features for kiosks. This device comes with an Intel® BayTrail™ J1900 2.0GHz Quad Core motherboard processor. So, it can install complex applications including advanced kiosks operations. However, it cannot be denied that self-ordering kiosks have several factors to take account. These also bears a challenging environment and frequent use of the general public. Can kiosks with S12 industrial PCs still provide better consumer experience? Read more on this blog and know the pros and cons of S12 panel PCs for kiosks installed on restaurants. Many restaurants are beginning to adopt self-ordering kiosks today. These kiosks have been proven to optimise the speed of service. Thanks to the advancement of technology, advanced PCs like S12 industrial computers can now be integrated into kiosks. Besides compatible system processors, this device has a built-in 1024 x 768 capacitive screen displays. So, it can adjust its display settings to provide clarity and better image views to the users. Hence, it offers better functionality regardless of the lighting features of a restaurant. Now, are the internal components of this device reliable and sturdy to withstand a harsh working environment? Note that self-ordering kiosks are exposed to different potential risks that may damage the internal system as well. So, let us have a quick check on how capable the S12 Intel-based panel displays are. Not all industrial computers are created equal. In fact, these computing devices also have limitations, especially in terms reliability. However, our 12.1” industrial-grade PC displays can have a Windows® embedded thin client software. This feature is a componentized version of Windows, which is easier to manage. This includes updated support for the newest devices as well as remote FX support. Therefore, it has the flexibility to support future kiosk applications. Not all industrial computers can be installed in any types of the workstation. Moreover, some computer systems do not even have these capabilities. However, these S12 panel PC displays have multiple mounting options. So, it can be mounted on walls, cased or bezel. As a result, this device is also the right computing solutions for food businesses with limited workspace. Food handlers can now utilise and organise restaurant activities even at small spaces. Most food businesses have dim lighting features to showcase a more relaxing ambience. While QSR services have well-lit interiors to highlight energy and vibe. So, we offer S12 panel mount PCs with a built-in 1024 x 768 capacitive screen displays. This feature provides adjustable display settings which automatically balances the lighting and brightness of the screen. Thus, users can utilise kiosks with these embedded displays well because it has more precise screen resolutions. Our S12 industrial panel computers are built based on the industry needs. It can have the technical specifications required for any industrial application. So, expect that this device can deliver productivity and efficiency to advanced kiosk installed in restaurants. As a kiosk manufacturer, it would be ideal to provide a kiosk with a long-term computing solution. That way, any future updates and kiosk applications can still be installed into the system. At the same time, food businesses like restaurants can improve its speed of services to their customers. Download our FREE S12 industrial computer Datasheet now or contact us today through (+44) 01438 747111 for more info about our products.